Sheet metal designing facilitates efficient production cycles and improved interoperability with contractors and suppliers. Professional sheet metal designs compliant with the industry standards further help businesses optimize and accelerate their manufacturing process, and are therefore extremely important. Engineers in the manufacturing industry find metal and sheet metal designing quite challenging since they need to comply with existing rules and quality standards while delivering tasks within quick deadlines. Our team has extensive experience with sheet metal components for aesthetics as well as functional designs, and can shorten lead times with reduced scrap & material costs. Vast experience and knowledge of sheet metal cutting design, helps us provide high-quality sheet metal design services as per the international standards to global customers. At Outsource2india, we specialize in providing end-to-end services for sheet metal design - product design, development, and optimization. Our team of sheet metal experts uses state-of-art CAD tools, CAE tools and a systematic approach to design sheet metal parts. This enables us to provide effective services that meet customer requirements on time and within the budget. Developing accurate fabrication drawings, 3D sheet metal models, manufacturing drawings, 2D flat drawings, assembly drawings according to manual blueprints, etc. Cost estimates based on material, number of operations etc. Once you outsource sheet metal design services to us, we provide top-quality architectural metal product designs and sheet metal designs by leveraging the latest and advanced design software. With us you can explore the power of good sheet metal cutting designs that reduce costs and help businesses in bringing products to market faster. With more than 11190 satisfied clients, we are able to harness our industry experience and our access to the latest technology and infrastructure to create cutting-edge metal designs. We leverage advanced 3D CAM/CAD software to create detailed laser-cut designs and other isometrics. This is turn ensures we are able to complete projects faster, while allowing for better revision control and reduced development lead times right from initial conceptualization to manufacturing. We also ensure that every design project is first virtually created in a 3D environment using 3D modeling software on our high-end CAD workstations so we can envisage the overall design while removing inaccuracies and fixing errors. Thereafter we use CAM software for the transfer of 3D data from the CAD systems without losing any intelligent attributes. This step is extremely necessary since it helps to eliminate errors that might occur during regular transfer, and is often overlooked by many sheet metal designers in their hurry to complete the project faster. 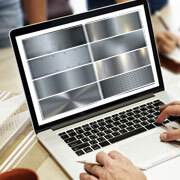 Why Choose Us for Sheet Metal Design? Outsource2india is a leading outsourcing company offering top-quality mechanical engineering services and sheet metal design services in India to global clients at affordable prices. By outsourcing sheet metal design services to us, you can be assured of reliable and affordable design and drafting services that help you through your projects. We offer a gamut of mechanical engineering services, which include casting design and manufacturing, mechanical CAD drafting, product design and development, etc. So, if you want quick, efficient, accurate, affordable services, then reach us now to outsource sheet metal design services.